Lestor Wong, da man from SGCollect.com, is back with a great review of the new Spidey villain, Carnage. It's all yours, Lestor! Series 8 of the new Spider-Man Classics line finally made its way into my area today, and I managed to pick up the most anticipated figure from the series, Carnage. Is he worth all the hype? Read on to find out. Spider-Man Classics is a line targeted at kids. No surprise then, that Toy Biz took the traditional bubble-on-card approach. I'm obviously a "clamshell" kind of guy though, and I've definitely no worries about damaging the packaging when I slit the bubble on Carnage. 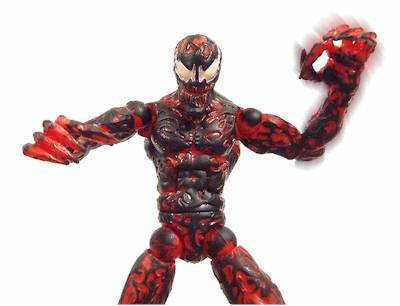 It doesn't help when Carnage looks awkwardly squeezed on card, because his accessories took up plenty of bubble space. 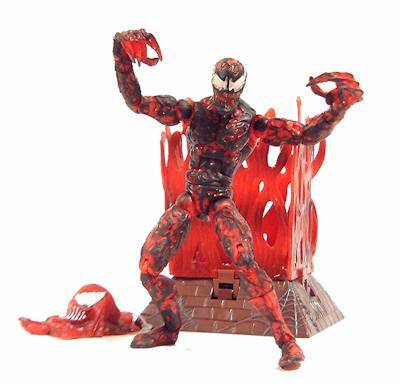 Carnage is what I'd call an "tricky" sculpt to work on. His primary frame aside, the major sculpted details are found on the flowing, yet uneven patterns all over his body. The squiggly nature of these patterns are potential areas of disaster for the sculptor, but fortunately Carnage turned out pretty well. His head sculpt is particularly impressive, giving him a really mean streak. 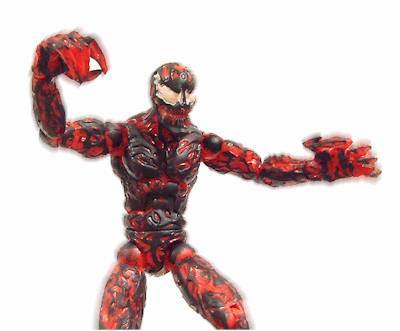 Overall, Carnage is an impressive sculpt that bears great likeness to the comic character. Carnage is primarily in red and black, and once again, because of the uneven surface, it's difficult to maintain a high standard on the paint application. There're some areas that the black doesn't exactly cover the sculpted details, and several other washes of black over-lapping onto the red parts. However, considering the dashed effect actually look quite cool on him, I'd give Toy Biz the benefit of the doubt here. Black paint spilling over to his eyes portion doesn't look too good though, and on my Carnage, an over liberal use of paint also means an untidy blotch on his left eye. Room for improvement, surely. 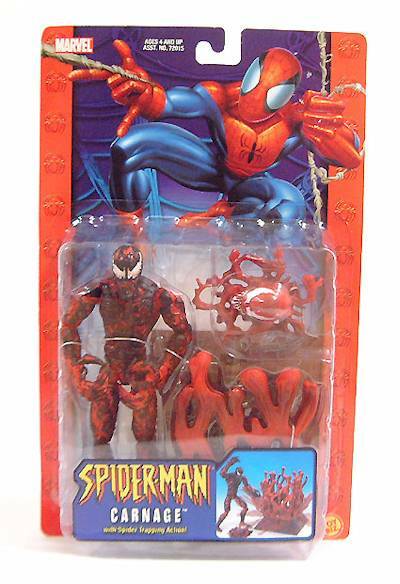 There're signs that Spider-Man Classics figures are getting more articulation, and Carnage more or less confirmed the signs. Boasting movement on his neck, shoulders (ball-joints), elbows (double), wrists, fingers (three points on each hand), ab, waist, upper legs (ball-joints), knees (double), cut lower legs, ankles and feet, Carnage has over 30 points of articulation, which naturally equates a hell lot of dynamic poses. 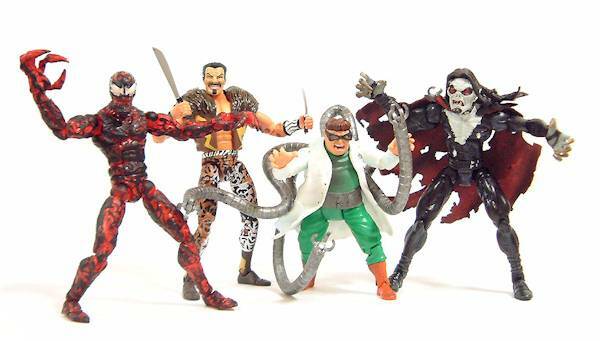 If articulation is your genre, you won't be disappointed with what Carnage has to offer. 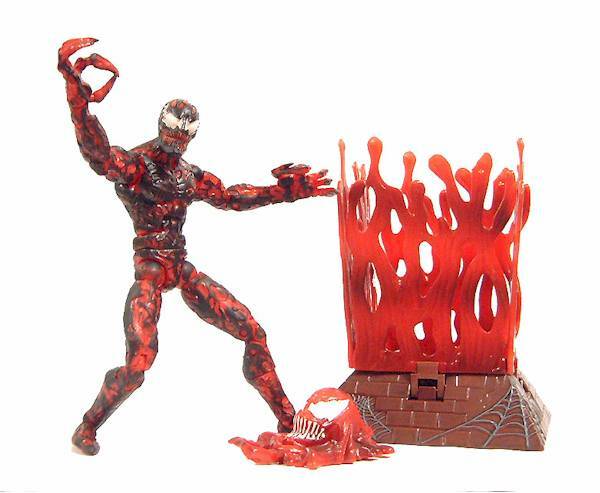 Carnage comes with a "spider trap", and seriously, this ranks as one of the lamest accessories I've seen with an action figure. The idea of this is similar to a mouse trap. You fix the flame walls onto the base, wait for your victim (presumably Spider-Man) to get into the trap, and then you pull and release a dial to close the cage. Sounds cool on theory, and looks great on the promotional image, but that's where the positives stops. Basically, this accessory is lame because it doesn't work! Instead of locking up a victim, a lot of time was spent wondering what went wrong, and what could be done to make it work. After a while, I decided not to bother. I've no doubt the base will be a hit with the kids though, but for me, it's a tossed away item almost as soon as I slit the bubble. Spider-Man figures in my region are generally more expensive than they are in the US, since they�re considered �imports�, and freight charges always inflate prices. 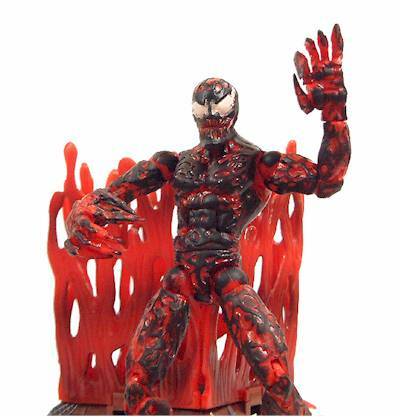 I picked up Carnage from a local departmental store for close to $10, and this is definitely not something that you�d like to pay for! Nevertheless, Spider-Man villains are often short-packed, so I was left with no choice but to pay the price for trying to form a Spidey rogues gallery. 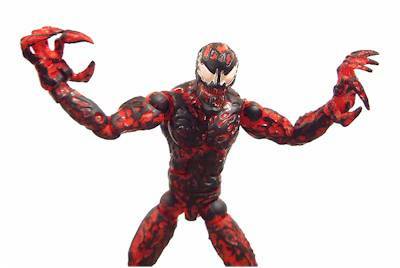 In summary, Carnage is a nice action figure that provides great posing fun. His accessory is forgettable, however, and he's slightly over-priced in my where I live. Still, he's a great figure for display, and I�d recommend him to fans who are building their own troops of Spidey villains. Figures from the collection of Lestor Wong.